a. Plasticized lining to the burlap which is great to wipe clean, waterproof inside for bath toys storage. b. Nice burlap material make it durable and not easily ripped or punctured. c. Cute and keeps baby's toy mess manageable,the word toys emblazoned on the front help babies learn the word! Toys! 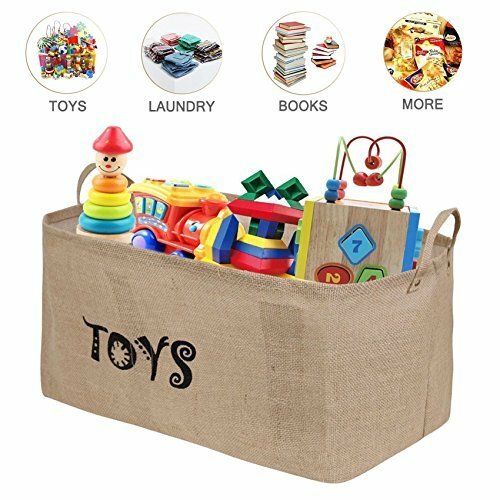 [Upgraded XXL Size]:Toy basket size: 22" L x 13" W x 11" and larger than other's 20'',with enough space to organizer books, dressers for bedroom, dog toy basket, kids storage cubes, and those many other miscellaneous toys that get scattered. Meanwhile keeping your living area clean and clutter free. [Well Holding Shape]:With 6pcs plastic pieces inserting to the 6 slots of the inside to keep the shape very well on any condition. New Improved Jute Thickness for seamless stability, with handles, Easy to lift it. [Foldable Design and Great Space Saver]: Canvas Toy Bins fold to 1" in height for easy storage, folds down flat when not in use. Lightweight solution for easy carrying. If you have any questions about this product by BonDream, contact us by completing and submitting the form below. If you are looking for a specif part number, please include it with your message.